I recently returned from a trip in Muang Paem, a scenic village situated in the forested hills of Tham Lod, Mae Hong Son. The 4 hours drive from Chiang Mai was filled with anticipation not only because we have to travel via winding mountain rugged road but much to excitement. After all, that was my first visit after more than 2 years of setting foot there. 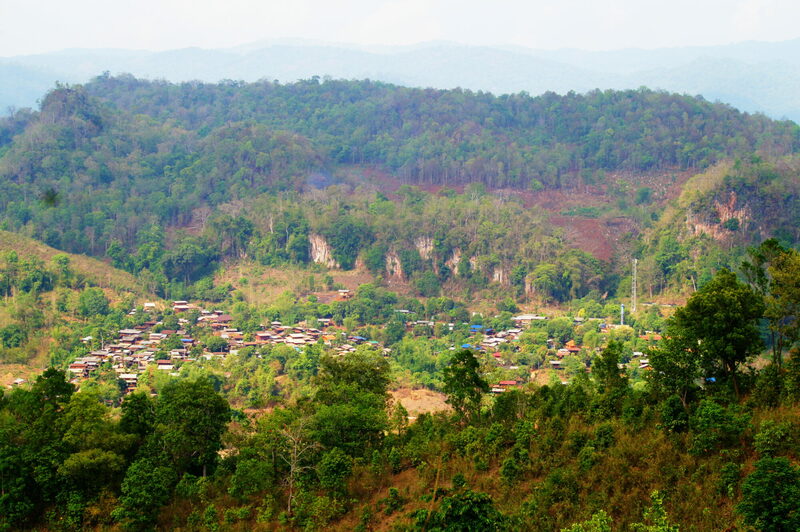 Muang Paem, used to be a participant of a tourism project under the Community-Based Tourism Institute (CBTI) and a supported joint project by UN agencies such as UNDP, FAO, UNESCO, to mention a few, is inhabited by predominantly ethnic Karen. Just like other ethnic communities, the people in Muang Paem are friendly and easy to get along with. And sure enough, when we arrived, a group of women weavers welcomed us and immediately made us feel at home. It was magical when they saw the sample hand woven fabrics and products we brought with us. With the “ah” “oh” and “gaey” (good), we immediately felt at ease and started having animated discussion about designs and colors. The main purpose of our visit to Muang Paem was to explore possible future collaboration with the women artisans. The village already has an established women textile group, composed of 40 weavers. They weave skillfully and produce fabrics that they made into functional items such as sarong, clothes, blouses, head dress, bags, blankets to mention a few. 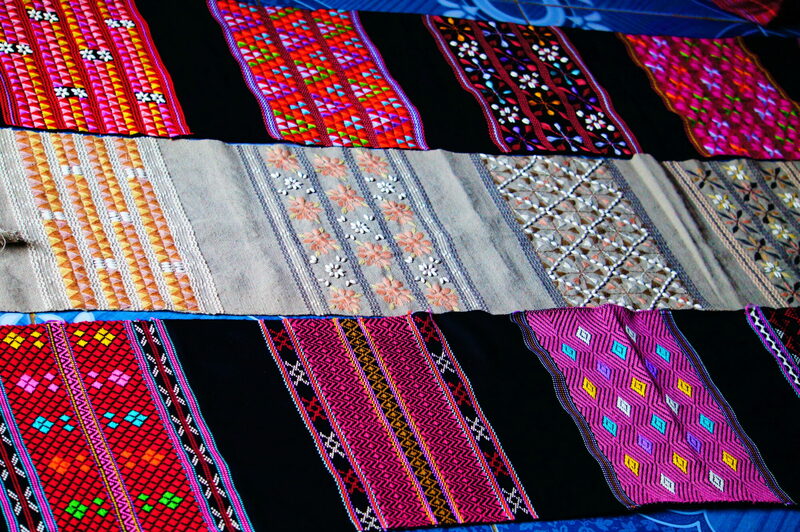 Wearing their traditional clothes – woven sarong, men’s top/shirt and embroidered blouses is part of their daily life. And this is no surprise as Karen girls learn how to weave and embroider as early as 10 years old. These local/indigenous practices are what keep their culture and tradition alive. The weavers use materials that are both natural dyed and synthetic cotton threads. The women uses back strap loom and their weaving routine flows within the natural rhythm of their lives. This gives them the appropriate time and tools to create traditional inspired hand woven products. It was amazing how our conversation around various traditional ethnic weaving and embroidery designs has stimulated and set the creative mode of the weavers. 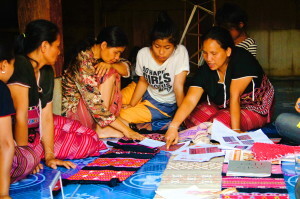 My colleagues Saeng, Morn Horm and Chit (who are also ethnic Shan and Karen) and I will never forget the excitement on their faces when they shared their ideas about color combinations, patterns and designs. Right at that moment, weaving connected us! The lives of the people in Muang Paem are deeply connected. Their roots, their culture, their identity and the survival of their future generations. Thus, the women play a major role in keeping that connectivity. Physically, they may be just weaving beautiful fabrics. However, culturally and emotionally, they are weaving the beautiful patterns of their lives into the beautiful pieces they are creating. The beautiful work of their hands. Thus, it is essential that balance is achieved. That they are able to meet new challenges in creating new designs and products that suits the demands of the outside market and at the same time protect and sustain their indigenous traditions, local knowledge and good practices. WEAVE highly regard and respects the relationships we have with various women’s groups and we are excited to establish future partnerships including with the Women Textile Group in Muang Paem. And we look forward to contributing in creating synergy and improvement in the livelihoods and quality of life of the weavers, their families and community. Mitos Urgel is the Executive Director of WEAVE. WEAVE Foundation works with disadvantaged and marginalized ethnic women and their communities on the Thai-Burma border and in Northern Thailand to advance their status and dignity. Our intervention is both direct and practical. We work in partnership with women’s groups to develop culturally sensitive, safe and fair livelihoods through their local crafts of hand woven fabrics and items inspired by their time honored designs. As a member of the World Fair Trade Organization (WFTO) we carry out our work guided by the 10 Fair Trade principles. WEAVE is one of the stakeholders of CBTI’s Mae Hong Son Green Map.